About Us - Welcome to the MadSci Solar Car Team! 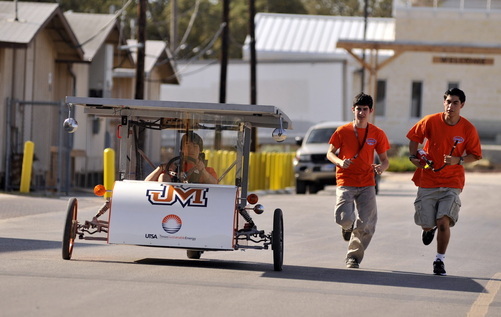 Based at James Madison High School, MadSCI is a team of students, faculty, and outside advisors designing and building solar cars to further science, engineering, technology, business, and renewable resources. The team has already built 3 cars: Solaris, Helios, and Nova! The goal of MadSCI is to bring together students of different backgrounds and let their talents and brain power intertwine to generate different ideas and inventions to adhere to problem solving. Learn more about us as we get ready for Winston Solar Challenge in July! Benefits: In 1993, the Winston Solar Car Team launched an education program to teach high school students how to build and safely race roadworthy solar cars. This program is designed to motivate students in not only the sciences, engineering, and technology but also in areas such as business, automotive design, electrical systems and public relations. The end product is the Winston Solar Challenge: a closed-track event at the world famous Texas Motor Speedway, or a cross country event designed to give students an opportunity to display their work. Preparation starts with a workshop in July, where new student teams and their teachers get a dose of best practices, fund-raising ideas, and technical expertise. My students have already attended this workshop. Kids plot their vehicle designs in the fall, and by springtime, teams must pass rigorous prequalifying tests (aptly called "scrutineering"). In addition to learning about engineering, alternative energy, battery technology, aerodynamics, computer science, and meteorology, students have to translate that knowledge into strategy. In striving to prepare students for success in the global community that our world has become, and to fuel their artistic and academic ambitions, motivate them in science, engineering, and technology, it has become increasingly necessary to expand the curriculum beyond the standard classroom. Students need to be exposed to and involved in activities that involve authenticity, collaboration, critical thinking skills, global implications, in-depth investigations, cross-curricular applications, and a very high student motivation and engagement factor. It was this desire to ensure student success in the global community that provided the impetus behind the undertaking of such a project as the construction of a roadworthy solar car with the additional goal of entering it into the Solar Car Challenge. This is the perfect beyond the classroom project because in striving to meet this challenge, students in addition to learning about engineering, alternative energy, battery technology, aerodynamics, computer science, and meteorology, have to translate that knowledge into strategy. Such a project furthermore, involves activities that empower students, foster deep learning and communication skills across a variety of subjects, enhance critical thinking and problem-solving skills, necessitate collaborative work, and provide experience working with students of different academic and technical skill levels. I would like to thank those sponsoring this project. Without their assistance, beyond the classroom projects such as this would not be possible. They are contributing to the maturation and development of our students into viable and successful individuals with the habits of mind and the discipline of the soul capable of achieving success in whatever future endeavors they choose to undertake.